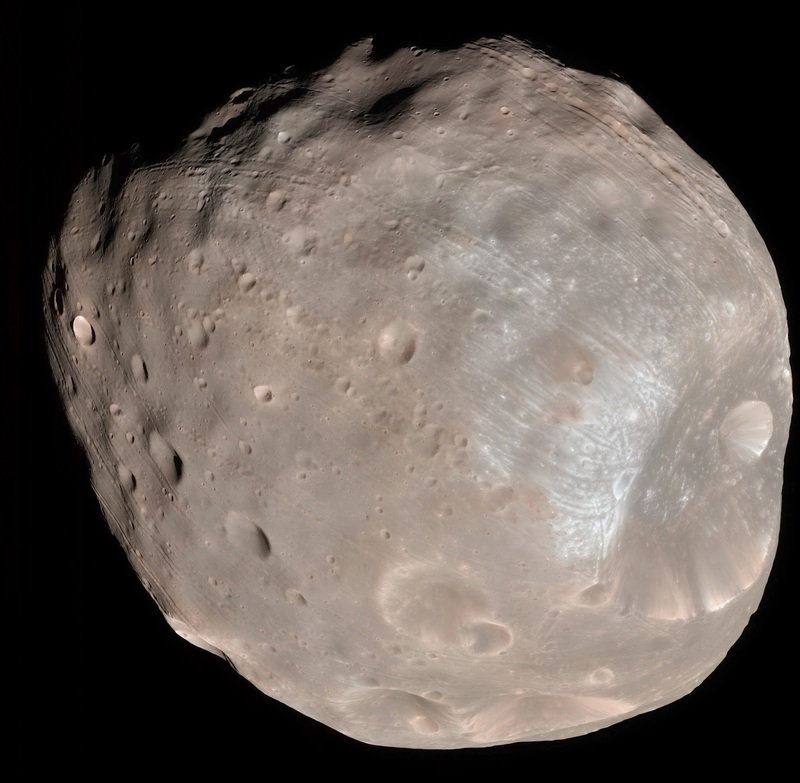 As we know that the Mars planet has two moons revolving around named as Phobos and Deimos. As compare with the moon Deimos, Phobos is larger than Deimos as well as it is closer to the planet too. Phobos is irregular in shape with mean radius of 11 km and it is seven times more massive than outer moon Deimos. These two natural satellites/moons of mars planet was discovered on 18 August 1877 by astronomer Asaph Hall at the United States Naval Observatory in Washington D.C. Astronomer also discovered Deimos (another moon of mars) on 12 August 1877. The name of Phobos is taken from Greek god Phobos, a son of Ares (Mars) and Aphrodite (Venus) which was the personification of Horror. From the surface of mars planet the Phobos orbits is only about 6,000 km (3700 mile) which is one and only closer moon known planetary moon. And most amazing thing about Phobos moon is it orbits the Mars planet faster than the planet itself rotates. Moon makes one complete orbit in 7 hours and 39 minutes. Due to which the moon appears to rise twice each Martian day. From the surface of the mars it appears to rise in the west and move across the sky in 4 hours and 15 minutes or less than that & set in the east. According to the research it is found that Phobos moon will collide with the planet or will break up into a planetary ring in 50 millions because of the tidal interaction due to which the moon is heading closer to the planet by one meter every century. It has −4 °C (25 °F) on sunlit and −112 °C (−170 °F) on shadowed side. This moon of the mars is one of the least reflective bodies in our solar system and features a large impact crater, Stickney. If we see the physical character of the moon Phobos than it has dimension of 27 x 22 x 18 km & is too small to be rounded under its own gravity. As we already know that it is least reflective bodies in our solar system; due to the low mass and low gravity it doesn’t have an atmosphere. It is heavily cratered. Moon seems to be similar to the D-type asteroid & is apparently of composition similar to carbonaceous chondrite material. The density of Phobos is too low to be solid rock and known to have significant porosity. Due to all these suggestion and research it is suggested that it might have substantial reservoir of ice. The observation also suggests and indicates that the surface regolith layer lacks hydration but the ice below the regolith is not ruled out. Mars planet is not protected from the radiation of sun as well as it does not retain heat at the surface. The atmosphere of the planet is less than one percent (1%) of our Earth’s atmosphere. 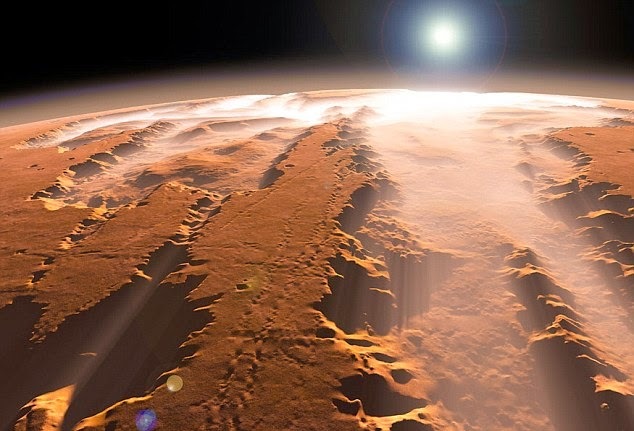 If we see the composition of gases present on the surface of mars planet than we can find out 95% of carbon dioxide, 3% of nitrogen, 1.6% of argon and trace amount of oxygen, water vapor and other gases are found. The surface of the planet is constantly filled up with the iron oxide due to which the color of the planet seems to be red. According to the research and scientists it is said that the planet has already loosen up it magnetosphere 4 billion years ago due to which atmosphere present on the planet is negligible. Magnetosphere is the region surrounding the planet in which its magnetic field is the predominant effective magnetic field and it channel the solar wind around the planet. If there is absence of magnetosphere than the solar wind will interacts with the ionosphere stripping away atoms and lowers the density of atmosphere. Different spacecraft have been detected ionized particles as they trial off into the space behind the Mars planet. This leads surface atmospheric pressure to be as low as 30 Pascal with an average of 600 Pascal compared to the average of 101300 Pascal of our Earth. The atmosphere extends to about 10.8 kilometer, about 4 kilometers farther than the Earth’s. This is possible due to the gravity of the planet is slighter & doesn’t hold the atmosphere as tightly. While researching on the Mars planet it is found that relatively large amount of the methane found in the atmosphere of the planet. Find occurs at a rate of 30 ppb. It is found that methane occurs in different areas of planet in large amount. According to the research it is found that there are two main sources for the methane on the planet i.e. centered near 30° N, 260° W and second near 0°, 310° W. it is estimated that every year the planet produces 270 ton of methane per year. During the favorable condition methane breaks down as quickly as 6 months. While observing the origination of methane it is also suggested that under the surface of the planet exists huge active source of methane. For the production of methane on the planet the volcanic activity, comet impact and serpentinization is the major cause. Due to the unfavorable atmospheric condition on the surface of the mars planet there can be great number of obstacles for human exploration on the planet. It prevents liquid water on the surface, allow the radiation to enter in such a high level that humans can barely tolerate as well as make difficult to grow food even in greenhouse. But the NASA and other space agencies are confident that within 30 years of time they will be able to create engineering solution for the problem.